Art In Wax miniature paintings come in many forms as I do love to paint small works of art. It can be a challenge to paint small using hot wax, but since I started to paint small, I still paint large pieces too, I have found that working on a small scale is both challenging and very rewarding. I use very fine nibs on my heated stylus when adding the details to my tiny paintings and they take as long as some other paintings as they require a good deal of concentration and of course a steady hand !!!! 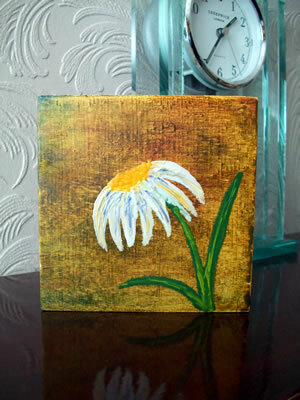 The daisy painting shown at the top of this post is just 4 x 4 inches in size and is painted onto a wood panel using R&F Handmade paints wax medium, this is a new painting and will take a few weeks to harden fully and cure. The small pieces art shown below are new arrivals in The Gallery ….. my “folly”, a 1:12 scale miniature scene Art Gallery my husband Adrian built for me to house just some of my collection of miniatures. They are painted using hot wax medium, Encaustic wax paint by Arts Encaustic onto card which I have then backed onto 2mm mount board, thus giving the paintings a strong support and a canvas style effect, ready to hany on a dolls house wall or displayed on a miniature easel. 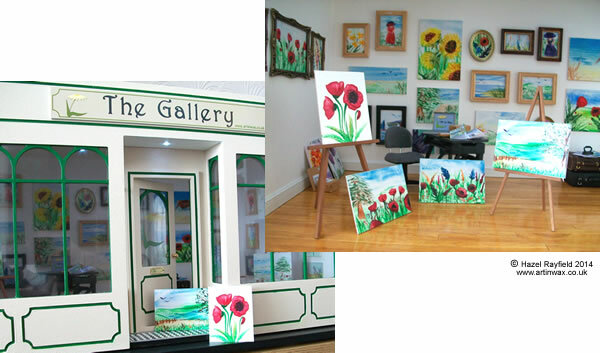 The new tiny paintings are displayed below on a new easel, courtesy of “Country Crafts” handmade miniature furniture. The three landscapes are 3 x 2 inches and the Poppies are just 2 x 2.5 inches in size. These paintings are now in my Art In Wax Miniatures store. Painting ACEO and ATC – Artist Trading Card size is great fun, each piece is 3.5 x 2.5 inches in size. 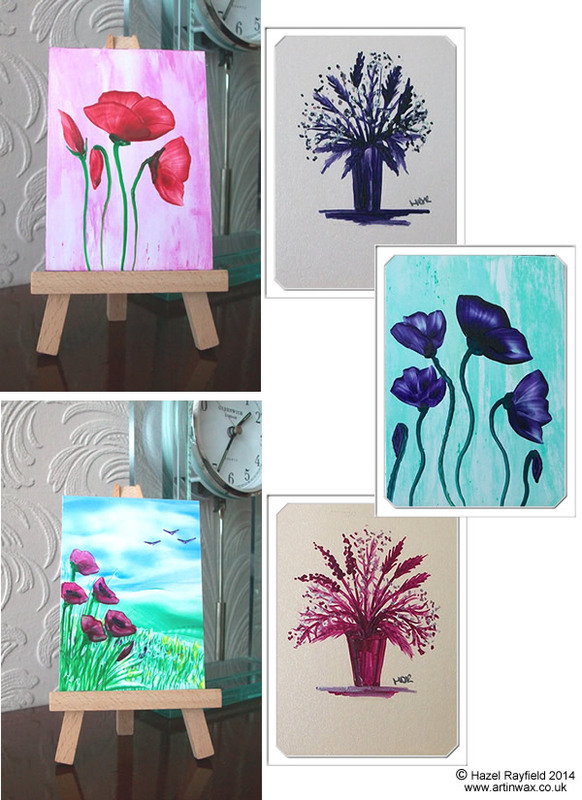 The Art in wax art cards I paint vary enormously, from these fun limited colour palette style vases, to elegant colourful flowers and pretty seascapes and landscapes, a small selection of new paintings are shown below, they have a great vibrancy of colour and the wax has a lovely sheen. All artwork is original and for sale, please contact me via my website for more information.